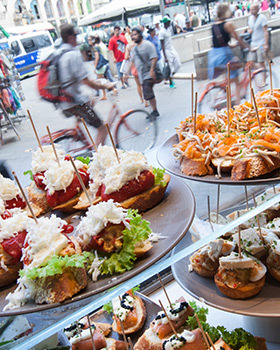 A festival of pinchos (small tapas) in the most popular Basque bar in Barcelona, with more than 51 different to choose, always top quality. “Txiquitos” of txacoli (whote wine) from Guipúzcoa. Authentic cider from Astigarraga. At the bar, at the table & also to take away. Enjoy a Special Meal of 7 pinches with a drink and ice cream. Special kids menu includes macaroni with tomato sauce or rice with tomato sauce and sausages, drink and ice cream.